Back in the days when I was campaigning for Allard K. Lowenstein, (relax-I was only 14 at the time), I always thought of Amnesty International as the ultimate peace organization… they helped the powerless. Later I looked at them as a mis-guided group that was a bit PC for my taste. It is only in the past five years or so that I began to see the group for what it is, Am-Nasty, an organization that cares more about politics than helping the powerless. In fact Am-Nasty HARMS the cause of Human rights much more than it helps. This supposed Human Rights groups has a political obsession with harming Israel that makes it ignore some of the real human rights abuses in the world. Amnesty’s publications in the region portray Israel as among the worst human rights violators in the Middle East (second only to Iran). In 2008. Amnesty issued more in-depth reports (9) and “Wire” articles (22) on Israel than any other country. The data indicate that media attention and ideology, in contrast to universal human rights, drive Amnesty’s agenda. Amnesty’s anti-Israel press releases consistently reflect the organization’s role in influencing international public opinion. Amnesty International’s 2009 Annual Report (for events in 2008) further demonstrates the NGO superpower’s highly biased approach. Amnesty grossly distorts the conflict, selectively reports events to erase the context of terrorism, ignores human rights issues not consistent with the political agenda, and repeats un-sourced and anecdotal claims. Amnesty promotes an overwhelmingly Palestinian narrative of events, blaming Israel for the end of the Gaza ceasefire and the weapons’ smuggling tunnels under the Egyptian border. Throughout 2008, Amnesty International continued its highly disproportionate condemnations of Israel’s policies, and led the NGO campaign accusing Israel of “collective punishment” in defense against aggression from Gaza. At the same time, this NGO superpower, which claims to promote universal human rights, largely ignored the hundreds of Hamas’ rocket attacks on Israeli civilians. NGO Monitor’s systematic analysis shows how AI’s reports lacked credible evidence, erased the context of terrorism, distorted international legal terms, selectively used data, and myopically focused on Israel as part of the wider ideological campaign to demonize the Jewish state. For instance, Amnesty’s August 27 statement headlined “Trapped – collective punishment in Gaza” grossly misrepresented international humanitarian law and immorally equated Palestinian terror attacks targeting Israeli civilians with justifiable Israeli responses aimed at ending these attacks. Israel’s legitimate security concerns were entirely dismissed, and the role of other players in the conflict (i.e. Egypt, Hamas) were also erased. Using a consistent methodology, NGO Monitor has again examined all of Amnesty International’s activities related to Israel and the conflict in 2008. AI publishes five types of documents addressing human rights. Based on the relative resources required to produce each type of document, as well as its relative impact, NGO Monitor has developed a rating system by which to measure, assess, and compare each of these types of publications. This analysis clearly shows the disproportionate focus on Israel in 2008. According to the analysis of Amnesty’s publication statistics, Israel is portrayed as the second worst human rights violators in the Middle East in 2008, following Iran, with a total of 56 items. The considerable attention paid to Iraq (45) is related to the presence of US troops in the country; many Iraq-related statements condemned US policy and military actions. Palestinian, Syrian, Libyan, Egyptian and Saudi human rights behavior receives far less attention from Amnesty. If narrowly focused Urgent Action documents are removed (see methodology), Israel and Iran are nearly identical. Amnesty issued more in-depth reports (9), which have the greatest impact, and Wire articles (22) on Israel – the most detailed publications produced by Amnesty – than any other country. 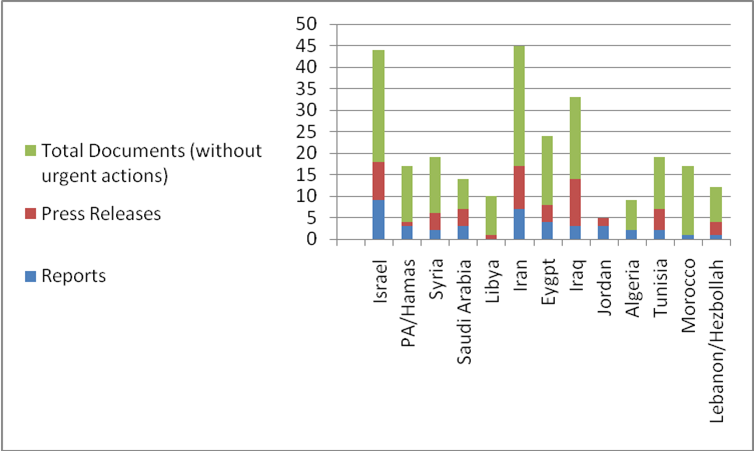 Only Israel and Iran (7) had more than 4 reports in 2008. 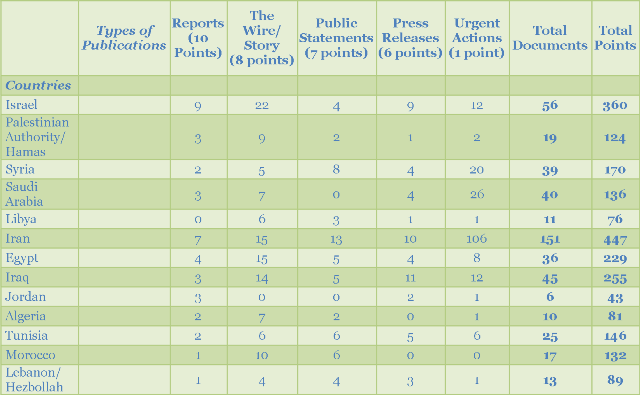 Based on press release numbers, Israel (9), Iraq (10), and Iran (11) were the most “newsworthy” locations in the Middle East in terms of human rights issues in 2008, whereas most other counties received less than half as many (in general 4). This distribution indicates that media attention, not universal human rights, drives Amnesty’s agenda. Amnesty’s press releases also reflect the organization’s central role in promoting the anti-Israel ideological bias that is characteristic of the human rights-based political network. Amnesty’s Urgent Action alerts, which are described as providing “an effective and rapid response to urgent situations involving prisoners of conscience, detainees, and other threatened individuals.” They are sent to the activist members of the NGO, and often reflect Amnesty’s traditional and core role in defending “prisoners of conscience” and “detainees,” in sharp contrast to human rights claims from conflict zones in which Amnesty lacks expertise, research capabilities, and credibility. The statistical analysis of Urgent Actions in 2008 represent a more balanced perspective on human rights in comparison with previous years, with the number on Iran (106) far outnumbering all other Middle East countries. Other abusive regimes Syria (20) and Saudi Arabia (26) also received significant attention in this category of activities. However, the absence of serious attention to abuses by many authoritarian states, including Libya, Lebanon, Algeria, Morocco, and Jordan, may reflect Amnesty’s awareness of the lack of media focus in these countries, rather than any human rights considerations. In 2008, as in previous years, the record shows that Amnesty International has singled out Israel to be falsely labeled as one of the worst human rights offenders in the Middle East. As NGO Monitor’s research has demonstrated, Amnesty’s agenda is driven by ideology, and the drive for media attention and influence, not by universal moral norms. Additionally, Israel’s democratic and open society ironically invites disproportionately negative reporting from Amnesty; access to information facilitates more comprehensive research than in less democratic regimes. Amnesty’s distortions and skewed reporting policy have greatly damaged its claim to be a defender of universal human rights. As the organization deviates from its original focus and mandate to politicized accusations against Israel, its credibility and objectivity are further eroded. Amnesty International (AI) publishes five types of documents addressing human rights. Based on the relative resources required to produce each type of document, as well as its relative impact, NGO Monitor has developed a rating system by which to measure, assess, and compare each of these types of publications. The Wire/Stories (8 points): Amnesty International’s monthly magazine, sent to subscribers and people involved in AI’s campaigns, featuring articles on events that are considered by Amnesty officials to be the worst cases of human rights violations. The articles are usually accompanied by color photographs and captions. There is also a small section at the end of updates about ongoing events or the resolution of tensions reported in earlier issues, as well as a list of Worldwide Appeals initiated by Amnesty International (these were not included in the sum of documents for each country – only feature articles were counted). In contrast to press releases, for example, which are written and published immediately, the articles featured in The Wire reflect greater investment of resources. Also included in this category, for the purposes of this study, are “stories” which focus on a particular human rights issue with supporting photographs and captions. Press Releases/Media Advisories (6 points): Only several paragraphs long, press releases announce newsworthy events and developments. Urgent Actions (1 point): According to Amnesty International, their “Urgent Action Network provides an effective and rapid response to urgent situations involving prisoners of conscience, detainees, and other threatened individuals.” This usually takes the form of a letter-writing campaign. The lower point value of this category reflects the focus on the plight of specific individuals rather than on national or regional events. Urgent actions often repeat information previously delivered in other types of documents. Moreover, many of these articles serve as updates to previous publications, or announce the end of campaigns and the resolution of the issue at hand.